The company bought its first YAK’s in 1992 and is run by ’94 British aerobatic champion Mark Jefferies, and supplies Yak and Eastern Bloc aircraft worldwide. To date, as well as to the UK we have supplied YAK aircraft to America, Germany, Italy, France, Spain, Holland, Hungary, Norway, Sweden, Denmark, Australia, New Zealand and South Africa. Yak UK holds factory dealership with Aerostar Romania and is in partnership with Termikas, Lithuania who hold JAR145 approval. Our maintenance facility provides top technical support and also supplies parts (largest spares stockiest for Yak in the West), and because our engineers deal almost exclusively with Yaks they know the aircraft intimately. The rebuild of a Yak 11 operated by Mark as G-BTUB. Flown by himself, it is a regular on the airshow circuit. The company flagship. The rebuild of a second Yak 11 found in Czech republic. 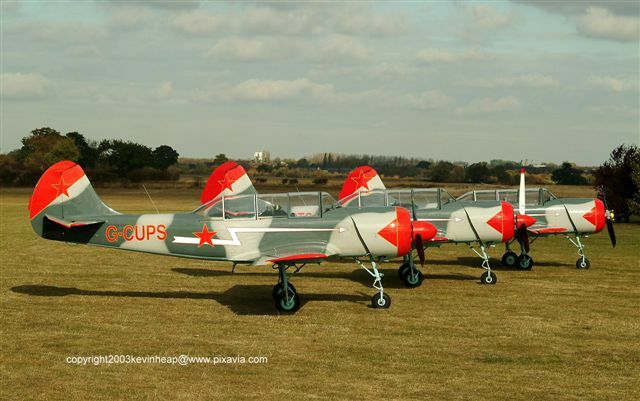 This YAK 11 has just been completed (June 2000) for Manfred Ruche, Classic Aviation, Hanover, Germany. Excellent Yak conversion and aerobatic training with Ian Austin at YAK City (Lt Gransden, EGMJ) and SKYTRACE at Halfpenny Green who use Russian instructors and specialize solely in Yaks. Anything else on Yaks which you may care to ask us. Engine overhaul shop (VINTECH in UK) with JAR 145 specializing in Radials and out of production vintage engines. Mark Jefferies with his brother formed the company in early 1993 for the purpose of buying and selling YAK aircraft from the FSU to supply the demands of pilots around the World. These pilots wished to have an insight into how the pilots of the FSU learned to fly. The YAK 52 was the basic trainer of the FSU since 1979 replacing the YAK 18A. Mark Jefferies aspired to owning a YAK 11 after seeing demonstrations at La Ferta Alias in France. This led to sourcing a restoration project that had been recovered from Egypt some years previously. The aircraft was painstakingly restored to flying condition over some three years. During this process an artist impression was commissioned, this was published by the painter in an aviation magazine. This remains the most popular scheme chosen by owners. By coincidence it was picked up by a passing Australian tourist who was in the UK after traveling from Russia. A phone call revealed that he had been in Russia and knew someone who could offer Yak aircraft for sale. A visit to Moscow as navigator with Rob’s Lamplough in his P51 Mustang as a guest of the Russian Air Force in September 1992 tied in very well with plans to inspect several YAK 52 aircraft. Unfortunately the Russian contacts like so many proved a waste of time. The route to Moscow in the P51 was via Praha, Krakow, Vilnius and Smolensk. Whilst at Vilnius (Lithuania) as guests of the Vilnius flying club, Mark had the opportunity for the first time of seeing and flying the YAK 52. It was some months later after some market research in the UK and a stroke of luck that led to the newly formed company in Lithuania whose interests were in Gliding. The directors had recently resigned from the Soviet Gliding team; this was upon the country obtaining its independence from the Soviet Union. Through their previous contact they had the opportunity of obtaining permission from the military for the disposal of redundant aircraft and gliders. Two aircraft were offered, and it was decided to purchase. This was in December 1992, not the best of weather ferry flying! The journey took 3 weeks to cover the 1000 miles! It was during early 1991 when in Romania inspecting a Zlin 526F that was being overhauled at Brasov that another right time/ right place stroke of luck took place. It was through a chance conversation that Mark discovered that the YAK 52 was currently being produced and the factory was only 3 hours drive away. This was of interest only at that time as a shrewd guess that some of the parts in current production could be adapted to fit the YAK 11 that was being restored. Guess what, the parts in 95% of the case have not changed in design. This was the end of the problem in sourcing systems parts and metric aviation bolts for the YAK 11. Whilst at the factory the management offered me a new YAK 52 for $145,000! This was of no real interest! The parts accelerate the YAK 11 to flying condition greatly. With the interest in the used YAK 52 market increasing and the factory not selling any aircraft at all to either the Russians or the West the factory prices fell to a level that enabled new aircraft to be sold at $75,000. This being in keeping with used aircraft at about $50,000. (Prices are 1993). To date all production from the plant has been supplied to the west with exception of a batch of 12 aircraft to the Hungarian air force & 24 to Thai airforce. All aircraft supplied include guarantees and training. Training is included in the purchase price and it is imperative that the best training instructors are used to make for the safe operation of these aircraft. We have Ian Austin on the books as a Licensed engineer and QFI, his web site has many documents to assist in training.